This is your Honda news, contributed and commented on by people like you. We all have an opinion man! “Impressive” is a bit of an understatement when describing Honda’s reinvented 2017 CR-V. Arguably, a very good 2-row SUV prior to the Fall 2016 release of the 5th generation CR-V, Honda takes financially attainable refinement, utility, sport, and fun to drive SUV attributes to the mainstream, we’re just a bit blown away by how good CR-V is. 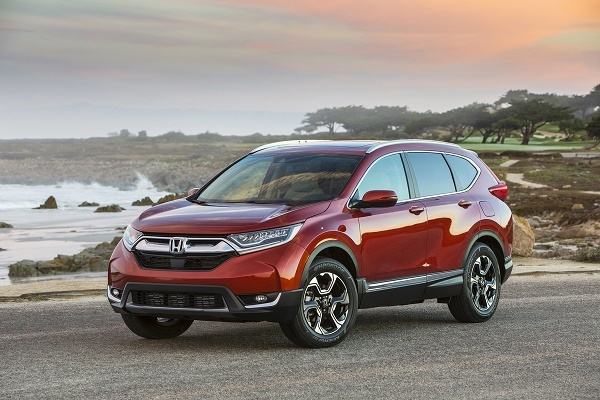 CR-V was already a very good SUV, in-fact, the #1 selling retail crossover, SUV of any size in the U.S. But as with most things, despite a major refresh in late 2014, CR-V was ready for a platform change. 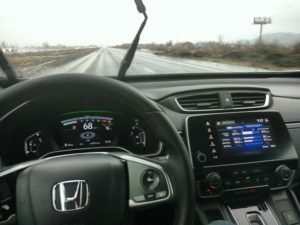 With introduction of the 10th generation Honda Civic, came the shared “compact world-platform,” along with a very good high torque output, fuel-efficient, and more importantly, clean burning state of the automotive art turbocharged VTEC engine – the first offered in CR-V – the performance difference is measurable. It’s not so much the added 10 horsepower, it’s where the seemingly endless torque kicks in. Coming on like a mule kick to the head at just a bit above idle, 2,000 RPM (revolutions per minute) or so, peek torque remains on demand through 5,000 RPM, effectively the “mid-RPM-working-range” of most engines today. The advantage found here is seamless grade transition. There is no shifting per-say, as the CVT (constant variable transmission) works in unison with the torque-happy 18 Lb. boost turbocharged 4-cylinder VTEC gasoline engine. Turbocharging, and CVT integration, results in a seemingly endless ‘flat’ torque curve, on demand “drive-by-wire’ instantaneous acceleration, and hill climbing torque. Also, the highest non-hybrid MPG in the compact crossover segment. *In real world road testing under mixed-route, extreme weather, I recorded 28.9 MPG. Interior comfort: While initially, I found the leather-covered, heated and 10-way power adjusted driver’s seat old-school-Honda stiff, within an hour or two, my body adjusted to it – the comfortable surround that is CR-V, becomes second nature as to operation – everything properly in its place, presenting arguably the most refined ride and drive experience in CR-V history. I like the overall “chunky” stance of CR-V. The driver’s seat height and subsequent commanding view out the windshield instills confidence, and a well-earned sense of safety in the operator and passengers. The interior layout is well-balanced, comfortable, and sensory appealing – with color contrasting soft and hard touch fabrics and plastics, offset by realistic wood-like accents, chrome, and brushed metal trims, complimenting a perfectly placed center stack, visual pleasing and unique instrument cluster, smart wheel, and single touchscreen entertainment, navigation, personal communication and cellphone-pairing driver to car interface – exceptional! Well, despite the pending danger of a torrential downpour in the weather forecast, we’d promised ourselves a drive out to the Oregon Coast, a mixed drive of surface streets and rural 2-lane highway. the Ocean rests 65 miles or so to the northwest, about 1 hour and 20 minutes from the old homestead. Nancy and I decided to go for it! Our 2017 Honda CR-V Touring activaes with a car recognizing key fob – the ignition is key less, and requires foot on the brake for startup. For 2017, Honda retains the electronic parking brake in CR-V, with 5 position select-stick control placed historically correct on CR-V’s dash. This arrangement affords ample cup-holder, cellphone-cable-connectivity and charge points, and a well-placed, covered storage bin, and stash place between the two front seats. 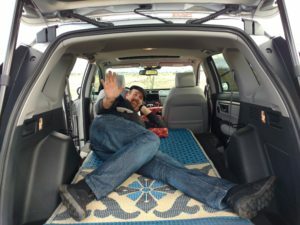 We discover the advantages of a slightly wider and longer manufacturing platform in CR-V, it’s comfy, even in the second row, affording excellent visibility to the front and sides from all seats — and yes, 2 full size adults, 3 in a pinch, child seats, and the family gold-fish, also fit in row 2 with room to spare. And, with a split 40/60 magic seat, so will your bicycle, surfboard, blowup doll, etc. Placing CR-V in reverse, a rather good resolution color monitor turns on. 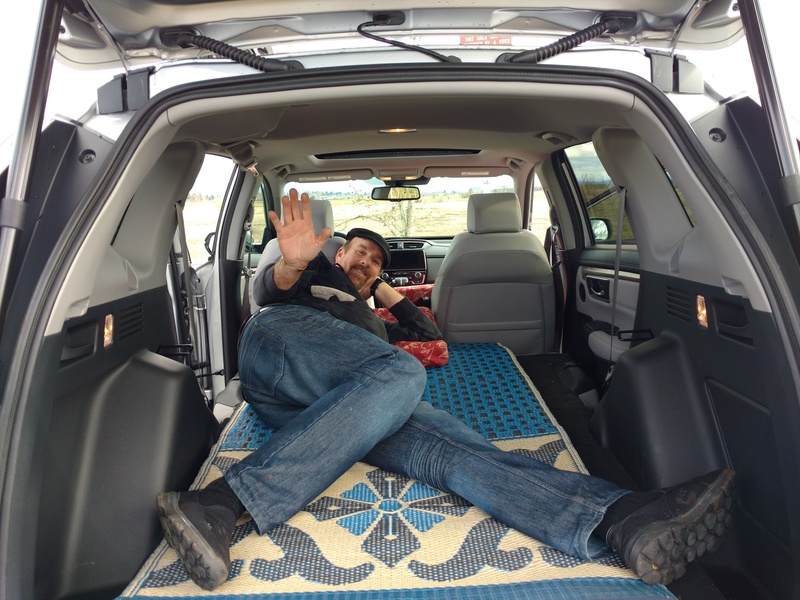 In the case of CR-V Touring, one has 3 view choice options. However, one of my favorite Honda options is not on board. The right turn “Lane Watch” cam is missing in action. In its stead is the exceptional accident preventative, mitigation measure, “Honda SENSING” Suite, now available on CR-V EX trim level or higher. Featuring adaptive cruise control, Lane Keep Assist, rear cross traffic sensors, mitigated automatic braking and more. At 3800 LBS, or so, 2017 Honda CR-V AWD Touring drives a bit heavy on 2-lane country roads. By that I mean it dives slightly into a turn, with a sense of controlled side roll. Granted, I’d just stepped out of Honda’s exceptional handling 2017 Civic Hatchback, a car that successfully injects 5-door utility and driving fun into Honda’s bread and butter lineup. So, my take on CR-V handling trends a bit pessimistic as of this writing. In short, Honda calls CR-V “The sporty SUV,” and when I inject the instant-on acceleration, torque, superior brake and steering reponce into the equation, I’d have to agree, CR-V is a pleasure to drive, especially on the long-run, it’s fantastic on the highway. With the 60/40 second row in the down position, tons of room! 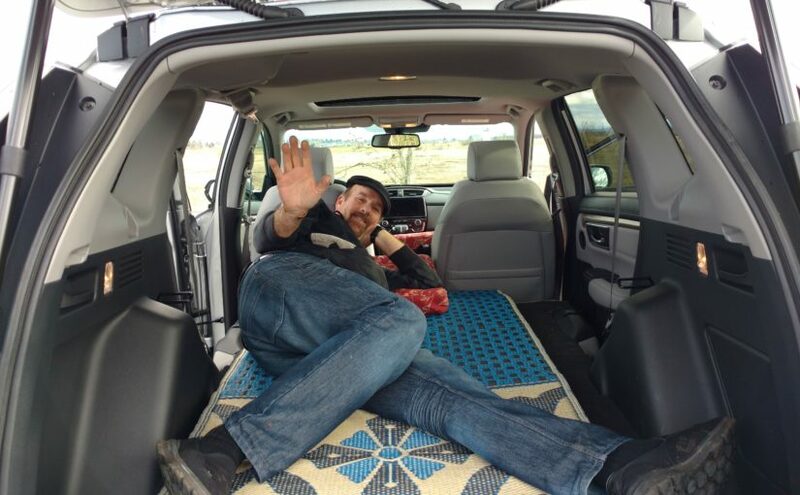 There’s no height or lumbar adjustment for the passenger front seat. A very minor idle oscillation occurs at idle, while sitting at the stop light. Engine and CVT pair to make a high-rev-run when accelerating hard. I’d like to see a full glass roof in CR-V, it doesn’t offer one. I find the (side bulb) rear tail light design a bit distracting in the rear-view mirror. That’s it! As I stated back in late 2014 with the major refresh of CR-V, Honda’s exception 2-row SUV retains the title of “best in class” for a very simple and succinct reason – it is! While our fully loaded 2017 CR-V AWD Touring came with a MSRP of $34,595 (Includes a $900 destination charge, Honda roadside assist, and Sirius XM programming for 1 year,) my personal build sheet totaled MSRP $38,935, for a very well equipped, AWD, turbocharged, compact urban assault 2-row. At the end of the day, CR-V is easy! I like that.